The New York Times on Friday downplayed results in its own poll that found 44 percent of respondents think the cuts in the debt deal didn't go far enough, versus only 15 percent who said "too far." In an article starting on the front page, writers Michael Cooper and Megan Thee-Brenan didn't mention this fact until the ninth paragraph of page A-14. 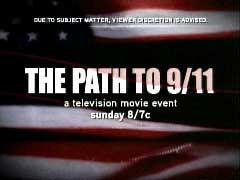 NewsBusters readers are certainly aware of the controversy created by ABC’s docudrama “The Path to 9/11.” In fact, we reported extensively on this issue here, here, here, here, here, here, here, and here. To bring people back up to speed, the left and former President Bill Clinton went absolutely berserk the week before this program aired due to some of the content. In fact, it culminated in ABC finally giving into all the pressure, and cutting some scenes from the final version aired. Miami Herald TV critic Glenn Garvin is blogging from the annual Television Critics Association tour, and found some hot talk in recounting the Clintonista war against ABC's movie on 9/11. There is potentially no more deplorable aspect of politics in the new millennium than the backwards-looking blame game played by both Parties on a daily basis. Whether it’s the economy, taxes, budget deficits, or corruption, members on both sides of the aisle always have an extended finger ready to accuse the other for the problems in the world. In the past four weeks, a new category for contestants has been created: The bin Laden’s-Still-Alive Blame Game. It is certainly no great surprise that once all the faux hawks – the doves that felt so threatened by the 9/11 attacks that they actually wanted to respond militarily – started feeling less vulnerable, the country would return to its 9/10 divisions. However, nobody could possibly have envisioned that five years later, the political parties would actually be debating who was more responsible for the national tragedy that fateful day. Stewart: "All right, so what, in your mind, you’ve worked, you’ve worked in government for most of your career. Now you are out and doing private initiatives, these types of things. What’s more effective? What are you having more fun doing and what do you think is more effective?" Yes, that’s right. Jon Stewart asked the former President what he found "fun," political or private life? It became clear, very early in the program, just how the talk show host differentiated between George W. Bush and Bill Clinton. Stewart: "We got a fine program for you tonight Former president Bill Clinton will be sitting down with us today. And uh, I'll ask him probably questions about the political climate and the complex issues, and he will be like [high pitched, hysterical voice], duh, I don't know. Oh, no, wait. That's, uh, oh, right, no, this is President Clinton." Though it aired a week ago, the New York Times continues to show outsized sympathy for critics of ABC's miniseries "The Path to 9-11." Tuesday's New York Times Arts section fronts L.A.-based reporter Edward Wyatt's "More Questions of Accuracy Raised About ABC Mini-Series on 9/11 Prelude."